For the second time in two years, Track Palin, the eldest son of Sarah Palin and an army veteran, was arrested on domestic violence charges. According to online court records, Palin was charged with felony burglary (involving an injury or attempted injury), misdemeanor reckless assault, and misdemeanor criminal mischief causing up to $999 in property damage. Details of the incident are hazy; NBC reports that he remains in custody. Back in January 2016, Wasilla police responded to a call from Palin’s girlfriend Jordan Loewe, who they reportedly found hiding under a bed and crying. Palin allegedly punched her in the face, kicked her, and threatened to kill himself with his semi-automatic rifle. Loewe filed for full custody of their newborn son in December 2016, and a month later requested a restraining order against Palin. According to court records, she was granted custody of their child in May 2017 after a contested hearing. He plead guilty to the misdemeanor charge of possessing a firearm while intoxicated, and the other charges were dismissed. Palin has another child with ex-wife Britta Hanson, whom he married—in the grand Palin tradition of godly abstinence—when she was six months pregnant and 21 years old. She has physical custody of their child, Kyla Grace. In 2016, Sarah Palin blamed her son’s violent actions on PTSD—and of course, Obama. “It starts from the top, the question though that comes from our own president, where they have to look at him and wonder, ‘Do you know what we go through?’” she said at a rally for then-Republican primary candidate Donald Trump. The Palins are evidently feeling slightly more circumspect this time around. 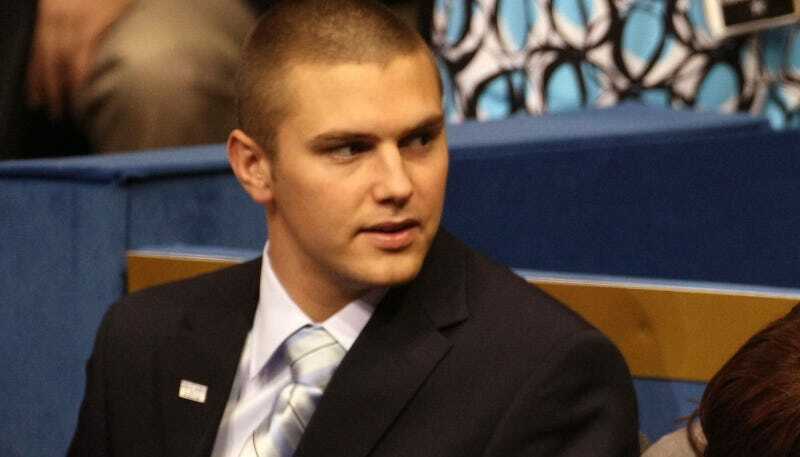 UPDATE: Track Palin was arrested for assaulting his father, the Anchorage Daily News reports. According to a sworn affidavit, Sarah Palin called the police saying Track was “freaking out and on some type of medication.” Track came to the family home after threatening to beat up his father over a truck he wanted to pick up, the report states. Todd Palin had told Track not to come because he had allegedly been mixing alcohol and pain medications. Todd Palin told the officer he got his pistol to “protect his family” and met his son with the gun when he came to the door, according to the affidavit. UPDATE, 4:30 PM: The Los Angeles Times has obtained the full complaint against Track Palin.